Grind spices coarsely in a spice grinder or coffee grinder. Put the chicken in a casserole pan, sprinkle the spice mixture over it, and then use your hands to rub it all over the chicken evenly. Position the chicken in an even layer in the pan and surround with dried apricot halves, and drizzle olive oil over it all. Cover and bake for 25 minutes, until the chicken is firm to the touch and reaches 180 degrees internally. Bring the stock to a boil, add olive oil, and stir in the couscous and salt. Cover and remove from heat, let stand covered for 5 minutes. 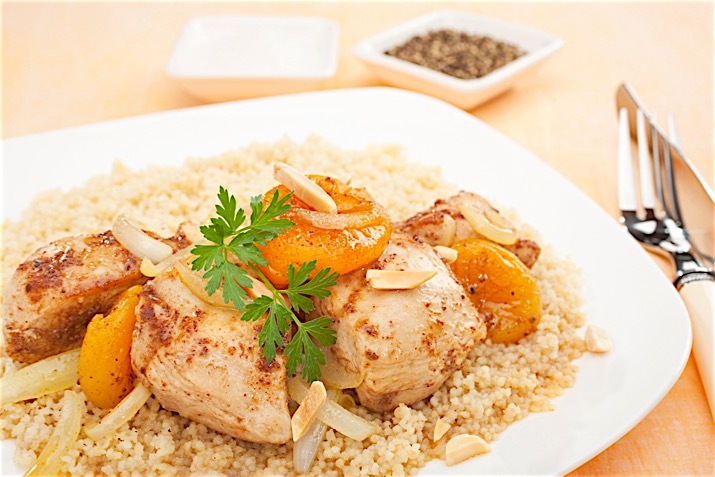 Spread the hot couscous on a platter and serve the chicken and apricots on top, sprinkled with toasted almonds and parsley.